Got the mail yesterday and found a letter addressed to myself from me and knew I had gotten notice of the status of my submission to the National Watercolor Society All Members Exhibit. Just before heading out to New York for a week or so of painting and exploring (more on that later) I hurriedly put together a submission for the juried show. 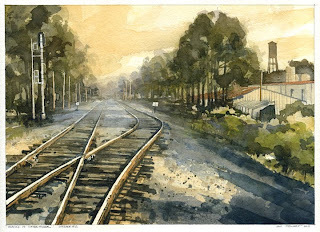 Well, my painting Tracks #2 Opelika, Alabama was selected by juror Mary Addison Hackett to be included in the show. Very pleased here. I'll post some pics and a bit of info on the New York trip in the next few days. I've been sifting through pictures, sketches, and a few on site watercolors, as well as doing some studio pieces of the trip. Beautiful and serine, I love the atmosphere in this one. Krista- thank you. This one came so naturally it was almost weird.